My husband Adam and I went hiking with our Greyhound, Seamus on Saturday. It was one of the first cold-ish days here in Vermont, and most of the leaves had gone. 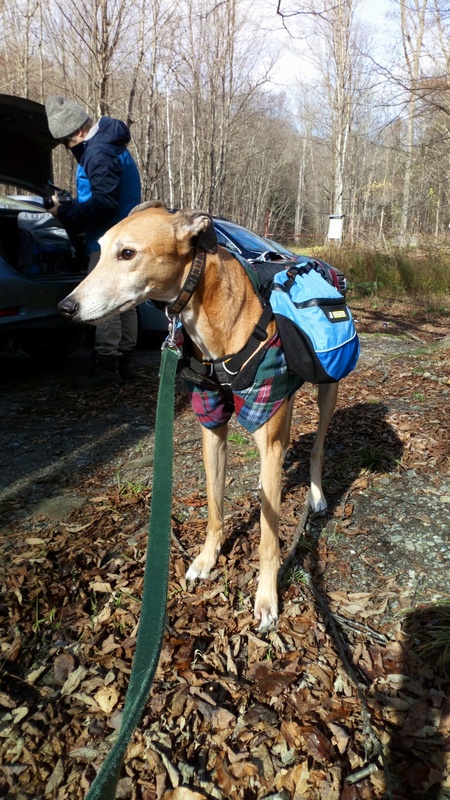 We have this amazing pack for Seamus that we got a couple of years ago when we took him backpacking, so he can carry his water and other stuff. The first time we put the pack on him and filled it up, he almost fell over. 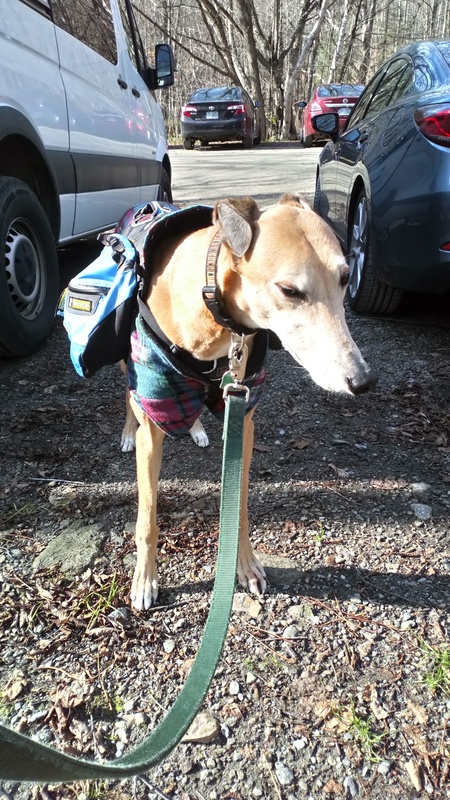 With his long skinny legs and already top heavy body, the pack almost took him over the edge. You could see him swaying in the breeze. Fairly soon he got his bearings and we were off. It had been some time since we used the pack for Seamus so he was a bit rusty. 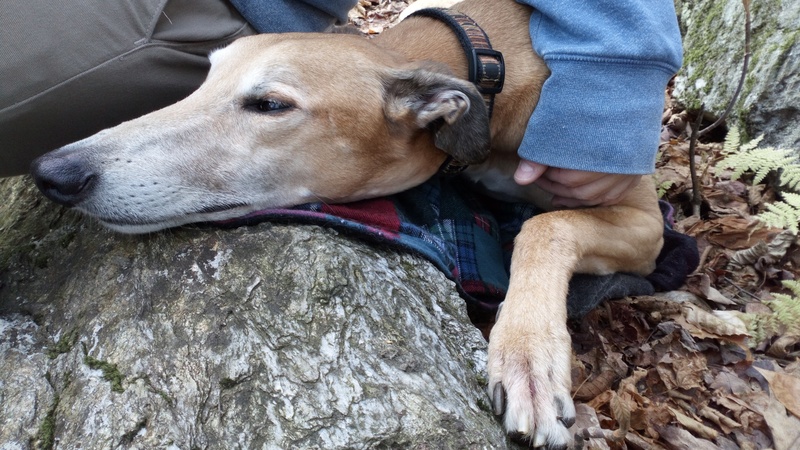 If you don’t know any greyhounds, just know that they look forlorn all the time. And with the pack on he looked especially forlorn. 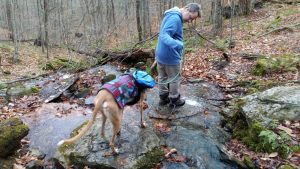 We had spent quite a bit of time deciding where to go hiking and whether to bring Seamus. A lot of websites have some descriptions but not enough to inform you whether bringing a dog is a good idea. We thought about it quite a bit and scouted around for good places to cross. 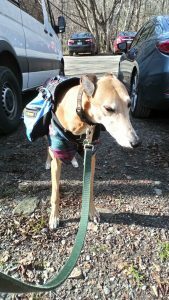 Mind you we have a reluctant dog with us and it is 40 degrees F. We consider going somewhere else but then decide to just go for it. Shoes and socks off we wade through the frigid water. Wow! What a way to start a hike. 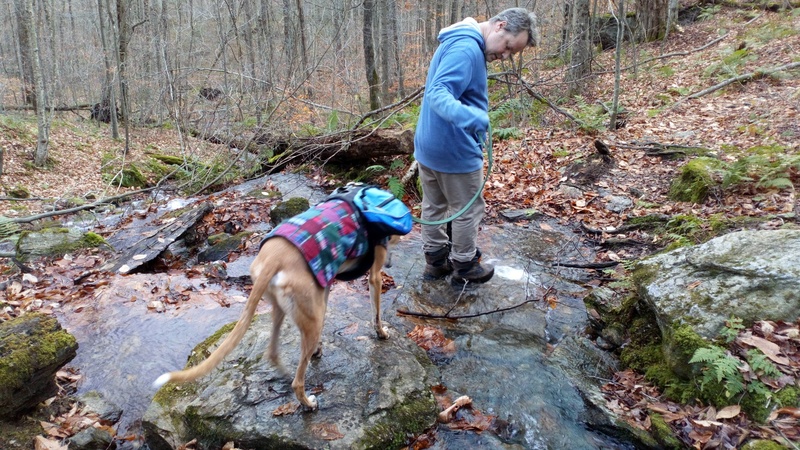 Much of the hike was uneventful, aside from Adam having to lift Seamus over many an obstacle. When we were what I thought had to be close to the summit, we started on a fairly steep incline. Seamus at this point was well worn out, as were Adam and I and we decided to turn back. The flat diagonal rock face and ladder were too much for us. That was a tough decision. Getting to the summit always feels like the reward you get for the work of the hike. Even though we would have made it if we didn ’t have Seamus with us, I don’t regret bringing him. Instead of the reward of the grand vistas we had some really hilarious views of Seamus. And the water was just as frigid on the way out.